When the first Meisterstück was manufactured over 90 years ago, it left an indelible mark on writing culture. Presented to the world by “Simplo Filler Pen Co.”, its “built-in inkwell” and hand-crafted gold nib revolutionised fountain pen manufacturing. This exceptional craftsmanship of the Montblanc masters produced an icon that would define superb writing experience for decades to come. 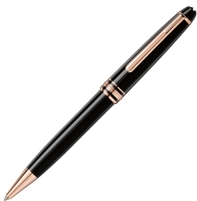 Writing instruments of the Montblanc Meisterstück Collection are inspiring symbols of rich tradition and the Montblanc inventive spirit as it continues to shape the future of fine writing culture.